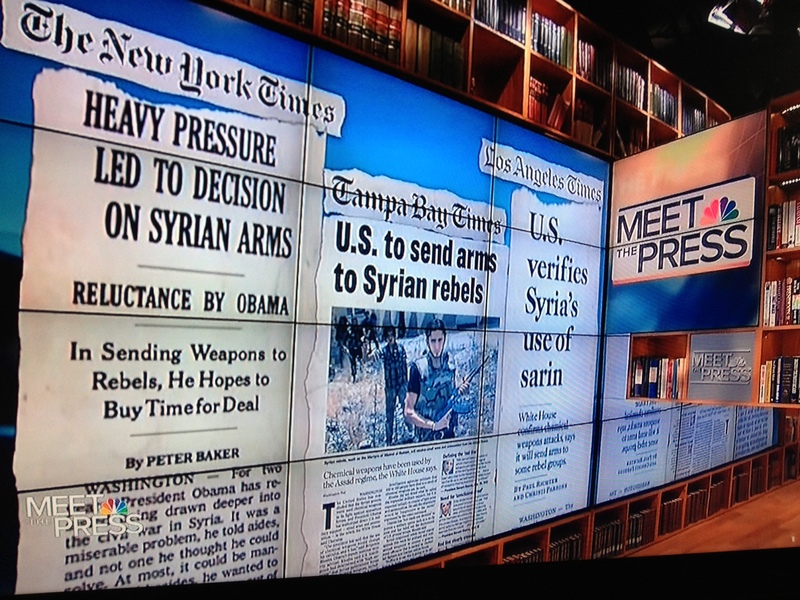 Later Graham said our goal in Syria should be balancing the military power “…and small arms won’t do it. So we need to create a no-fly zone.” Graham says we need a political solution which involves having President Bashar al-Assad leave Syria. David Ignatius of the Washington Post said our goal should be to build up the moderate opposition in Syria. He said that it would be bad if Assad left today because right now the jihadists are the most powerful, and they would take over in Assad’s absence. Andrea Mitchell of NBC News added that one of the biggest problems for the Obama Administration is that Russia has categorically denied that chemical weapons have been used in Syria and the United Nations Secretary-General has agreed with Russia. “They are challenging the American intelligence, and frankly, after the last decade, US intelligence on weapons of mass destruction doesn’t have a lot of credibility around the world,” said Mitchell. Graham acknowledged that if the Assad government falls there will be another battle over who takes control. He said the average Syrian does not want to replace Assad with Al Qaeda extremists. Moving on to other topics, Graham ended by saying he has “never been more optimistic” about the chances for passing immigration reform. He predicted they will get 70+ votes in the Senate. When asked who he thinks is the leading figure for the Republican Party’s 2016 presidential nomination, he said that if we don’t pass immigration reform the Republican party will continue it’s “demographic death spiral” and it won’t matter who the party nominates. Senator Saxby Chambliss (R-GA) said that if Edward Snowden is not a traitor he is very close to one and should be brought to justice. Senator Mark Udall (D-CO) said he’s not sure that collecting metadata on millions of Americans’ communications helps us, and it may violate the Fourth Amendment. Udall said he will introduce a bill that would limit the targets of this data collection to those that have a link to terrorist threats.